Can you imagine never having a new pair of shoes? Only attending school half of the time as you must share your clothes with a sibling? Or an entire family sharing one toothbrush? This is the reality for many of the children we serve. 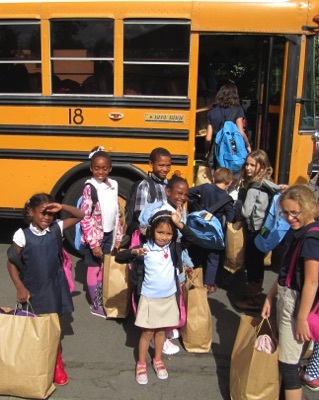 Operation School Bell is the signature philanthropic program of Assistance League across the United States. The program provides new school uniforms and clothing to children identified as “in need” by their schools. Each child is individually fitted by chapter members and provided with: 4 shirts, 2 pants, 6 pair socks, 6 underwear, shoes, sweatshirt, jacket, toiletries, backpack, school supplies, and an age appropriate book. Currently we serve students in grades K-8 from the Arcadia, Alhambra, Monrovia, Duarte, San Gabriel, Temple City and Rosemead school districts as well as students of the Almansor Center (a community based education and training facility for at-risk youth). Operation School Bell has assisted more than 25,000 children in need with clothes and school supplies since 1970 and clothed over 1,000 this past year. We also provide bathing suits, clothing, and necessities to children attending summer camp on scholarship.